Data in this report are drawn from the panel wave conducted Dec. 4 to Dec. 18, 2017, among 4,729 respondents. At the time this wave was conducted, the panel was being managed by Abt Associates. 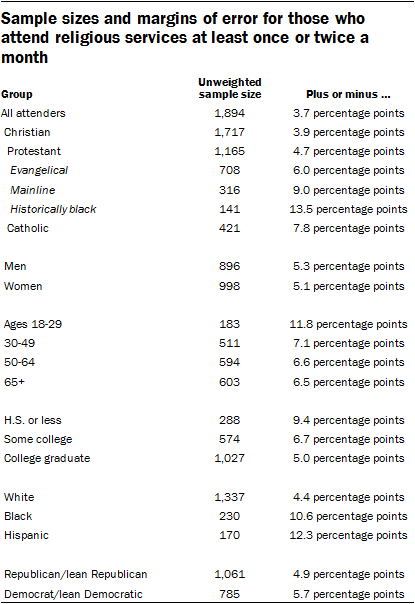 The margin of sampling error for the full sample of 4,729 respondents is plus or minus 2.3 percentage points. Many of the questions in this survey were filtered on how frequently respondents say they attend religious services. 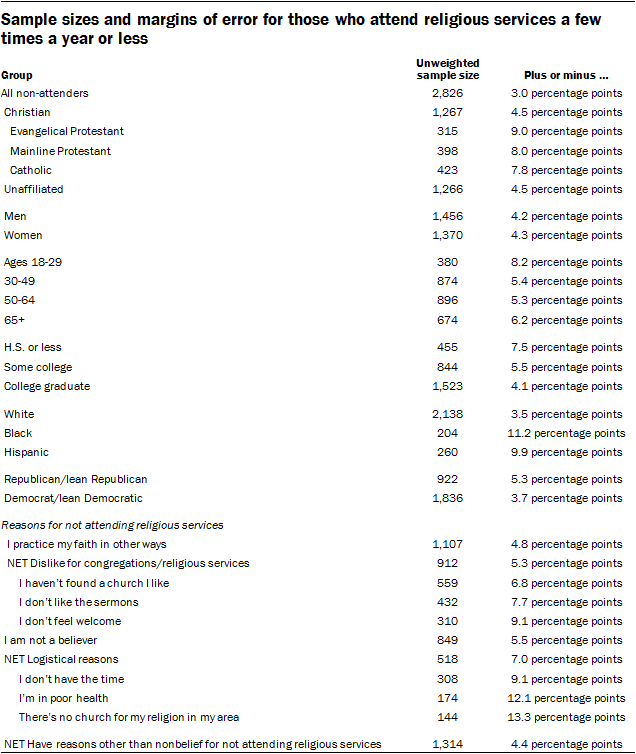 The margin of sampling error for the 1,894 respondents who say they attend religious services at least once or twice a month is plus or minus 3.7 percentage points. The margin of sampling error for the 2,826 respondents who say they attend religious services a few times a year, seldom or never is plus or minus 3.0 percentage points. The ATP data were weighted in a multistep process that begins with a base weight incorporating the respondents’ original survey selection probability and the fact that in 2014 some panelists were subsampled for invitation to the panel. Next, an adjustment was made for the fact that the propensity to join the panel and remain an active panelist varied across different groups in the sample. The final step in the weighting uses an iterative technique that aligns the sample to population benchmarks on a number of dimensions. Gender, age, education, race, Hispanic origin and region parameters come from the U.S. Census Bureau’s 2016 American Community Survey. The county-level population density parameter (deciles) comes from the 2010 U.S. decennial census. The telephone service benchmark comes from the July-December 2016 National Health Interview Survey and is projected to 2017. The volunteerism benchmark comes from the 2015 Current Population Survey Volunteer Supplement. The party affiliation benchmark is the average of the three most recent Pew Research Center general public telephone surveys. The internet-access benchmark comes from the 2017 ATP Panel Refresh Survey. Respondents who did not previously have internet access are treated as not having internet access for weighting purposes. Sampling errors and statistical tests of significance take into account the effect of weighting. Interviews are conducted in both English and Spanish, but the Hispanic sample in the American Trends Panel is predominantly U.S. born and English speaking.